Boat Registration Number Lettering Decals Sticker Vinyl Vessel PWC 2 Sets 3"x20"
mxnumbers has no other items for sale. 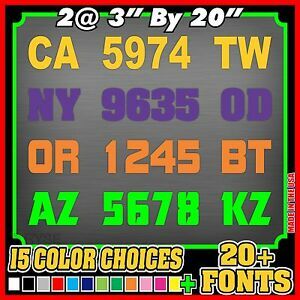 Details about Boat Registration Number Lettering Decals Sticker Vinyl Vessel PWC 2 Sets 3"x20"
Awesome, fast shipping, item as described, AAAA++++EBAYER!!!! THANKS!!!!!!!!!!! Fast Service Just what I wanted. Will use again.